229 people in our community are currently praying with you. 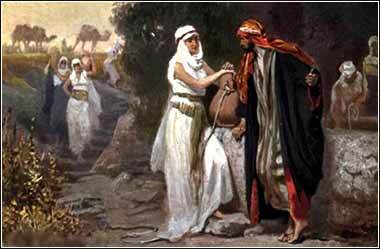 Moses meets Zipporah at the well, artist unk. Then Moses was afraid, and thought, “Surely the thing is known.” When Pharaoh heard of it, he sought to kill Moses. But Moses fled from Pharaoh and stayed in the land of Midian. And he sat down by a well. Unlike most of the great heroes of the Bible, Moses' early life is rather unremarkable. There is the way in which he escaped death as a baby, but we are not told that this is any sort of supernatural mark, and although the circumstances were interesting, many Hebrew babies must have lived through the purge; for we see many Hebrew men of Moses' generation. He does have strength, both strength of character and physical strength; he kills an Egyptian, the fighting Hebrew clearly anticipates that Moses might be able to kill him, and he drives away a band of shepherds from the well. But this is presented to us as a human strength. The Hebrew fighter pointedly notes that Moses is nobody special. No angel or voice has announced him; he does not have special obligations, rights, or prophesies. He is nothing more, at this point, than an escaped slave with Egyptian blood on his hands. The verses today might be the beginning of an adventure novel. He does take advantage of an opportunity, to get in good with a very minor shepherd, but it is his salvation, for surely he would have died eventually in the wilderness by himself. Nobody is sure where "Midian" was, but we see the tribe of Midianites several times. Midianite traders sold Joseph into slavery in Egypt. (Genesis 37:36) The tribe was apparently descended from Abraham by his wife Keturah. (Genesis 25:1-2) Most likely, Moses had fled to the northwest corner of the Arabian peninsula, which is both a logical place for the Midianites to call home and the fastest route away from Egyptian influence. Moses has a son, again a rather normal occurrence with no great religious significance. He calls him Gershom, which sounds like Hebrew for "sojourner". But the naming does give us the haunting phrase, "stranger in a strange land", used by Robert Heinlein as the title of a famous science fiction novel. : I can do all things through Christ who strengthens me.